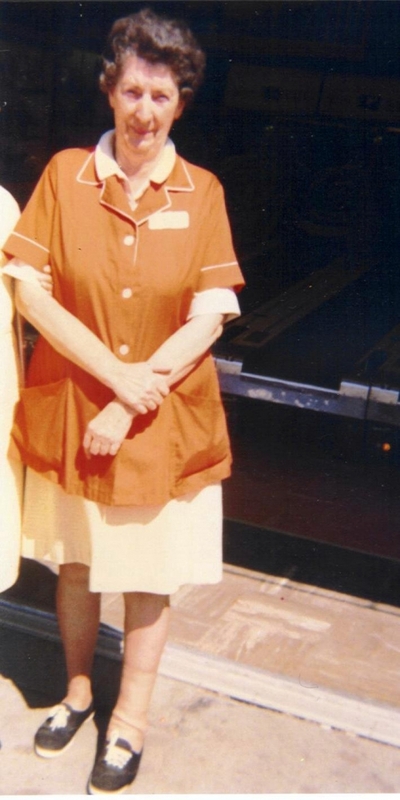 Mary E. “Betty” Kingdom (August 19, 1915 – February 15, 2005) worked at the Boardwalk for thirty years. She was a dedicated employee of the Santa Cruz Seaside Company and would work extremely hard during the height of the season. During the winter she could be seen working alone as rain and tidal surges kept patrons away. She told stories of families, strangers at first, that would return year after year and with time became part of her larger family. Later in her life she took a trip to New Jersey to visit her birthplace. While she was touring around, she explained on her return home to Santa Cruz, “The funniest thing happened, we were walking around and I heard someone exclaim, ‘Look, it’s the Skee Roll Lady!” She had a far reaching influence. During her 30 years she supervised many people – young and old – kids making gas money during high school, others working their way through college, and people who had life-long careers working at the Boardwalk. Her own children, six altogether, worked the boardwalk and a number of her grandchildren followed suit. She met many famous people, too. The Skee Roll Lady remembered meeting Walt Disney when he came to Santa Cruz to buy the Boardwalk but was turned away. She met movie stars and political figures. She even told stories of guiding the young Mr. Canfield as he began to learn the ropes. Above all else, for those 30 years, The Skee Roll Lady was the public face, the family-centered heart of the Boardwalk to many, many people. I know this well, because the Skee Roll Lady was my grandmother.